With all that launching at Bunnell Blast and me being sick, I had to at least crawl out of the house and launch one local! It was nice to launch because I was able to test an update fairly significant update to the app that I wrote over a month ago. 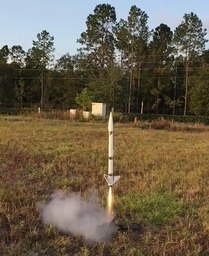 The App was all set to go since I expected to launch the EZI-65 to 9500 feet at Bunnell Blast! The test passed with flying colors. Look for the new version of the app online at the play store in the next few days. Note the altitude drop due to the extra weight of being equipped for full dual deployment. I'll switch to F motors once I am out of Es. The phone used for the launch was the Nexus 4 as the Nexus 5x is too big to fit currently. I'll modify the nose section to accommodate the 5x on another iteration. Hope you can be at the december launch!